Our world is in crisis today; we see devastating news from all over. And THIS IS THE CHURCH’S FINEST HOUR, don’t you think? It’s the church’s finest hour to not just pray for the transformation of nations, but to become the transformation that we are praying for; to not only pray for revival across nations to come, but to become the revival that we are praying for. But how does that look like? In 2 Chronicles 7:14, we see a seeming “formula” for transformation: “If my people who are called by My name (that’s us, the church) will humble themselves (that’s humility), pray and seek my face (that’s hunger for God), and turn from their wicked ways (that’s holiness), then I will hear from heaven, forgive their sins, and heal their land (that’s transformation).” So, could a lifestyle of humility, holiness, and hunger for God-- by the church-- bring about a national or even global revolution, reformation, and revival? We know that He is always true to His Word. ​This lifestyle of humility, holiness, and hunger for God was the same lifestyle of the Nazarites who took a vow of separation unto the Lord. They were Old Testament leaders who took the meaning of commitment to the highest level as they became God’s grace to the spiraling moral degradation of Israel during their time. WE NEED MODERN-DAY NAZARITES TODAY. 1. Fill-up application form or register online. 2. One recent Passport or 2×2 size ID photo attached to the application form. 3. Endorsement letter from the Pastor. 4. Pay the registration fee. Please email a scanned copy of the deposit slip to nazaritetraining@jesusrev.com or call the office at (02) 9958795 so we can properly acknowledge your deposit. Thank you! 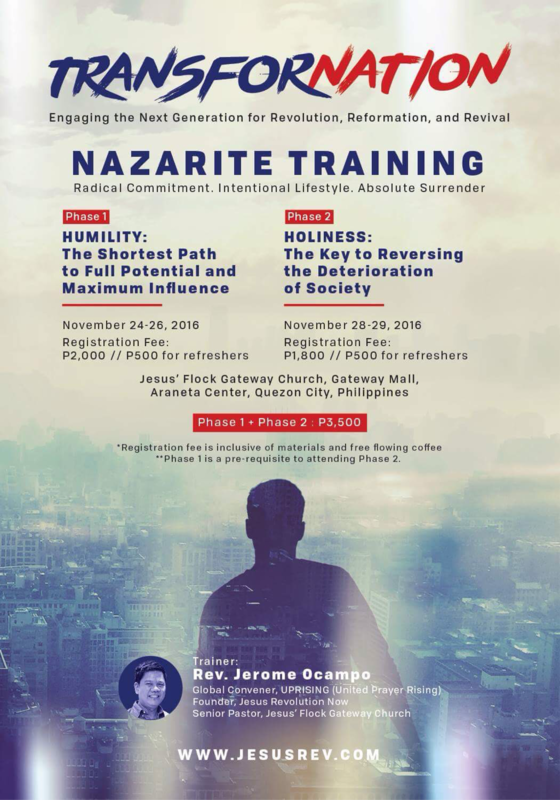 Request for a Nazarite Training, CLICK HERE!